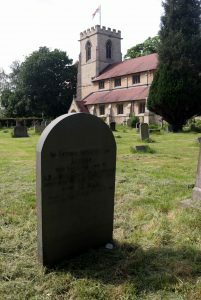 Alfred Martlew’s grave in St. Andrew’s Churchyard, Bishopthorpe. He died 5 July 1917. On Sunday, 5th June, a commemoration event for conscientious objectors of the First World War from the York area, will be held at Bishopthorpe Church Hall. This is an unusual event for Bishopthorpe and you may wonder why York Quakers are commemorating the men here, in the village. One of the men, Alfred Martlew, drowned and his body fetched up on the river bank at Bishopthorpe below the Palace grounds. He had been employed as a clerk with Rowntrees and had applied to the York Tribunal for exemption from military service. His application was rejected and he was imprisoned at Richmond Castle with 15 other conscientious objectors; famously known as the Richmond 16. In May 1916, the men were posted to France, where they again refused to obey orders. Tried by court martial, they were sentenced to death, but this was commuted to 10 years hard labour. Back in England, they were sent to various prisons. In 1917, Alfred returned to York, it is thought, to see his fiancé, Annie Leeman. They met and Alfred told her that he intended giving himself up as he was a deserter. He stated that he had not received proper treatment from the Home Office and appeared to be extremely depressed. Miss Leeman last saw Alfred on 4th July. His body, which was caught in the willows on the river bank, was discovered on the 11th July by James Holt, a gardener at Bishopthorpe Palace. Alfred Martlew, who was originally from Gainsborough in Lincolnshire, was buried on the 13th July 1917 in St. Andrew’s Churchyard, Bishopthorpe. He was aged 23 years. His place of burial is marked by a headstone; probably erected by his parents as their names are carved on the stone with their son’s. The Quakers’ commemoration on Sunday, 5th June 2016, at Bishopthorpe Church Hall, is from 2.30pm to 4.30pm. There will be a talk about York’s conscientious objectors and a display. A gathering is to be held at Alfred’s graveside. See also A.J. Peacock, York in the Great War, 1914 – 1918, (York Settlement Trust, 1993) pp532-533. The report of the Coroner’s Inquest can be found in The Yorkshire Herald, Friday, 13 July 1917, p2, col. 3. A transcription can be seen at the Bishopthorpe Community Archive in Bishopthorpe Village Hall, Main Street. Open Mondays 2.30pm – 5.00pm.